Janine Jackson interview Nilay Patel about the AT&T/Time Warner ruling for the June 26, 2018, episode of CounterSpin. This is a lightly edited transcript. The thing is, most people don’t take corporations’ promises about the benefits of mergers at face value. Perhaps especially in media, concerns about the concentration of power in a few hands are keen and, one would think, almost automatic. But US District Court Richard Leon is not most people. Leon has just ruled that the merger of AT&T and Time Warner may proceed, rejecting antitrust concerns presented by the Department of Justice and, indeed, Leon says the giant telcomm carrier and the giant media company can merge with no conditions whatsoever. The ruling is weird, bad and important, and worth understanding, our next guest says, for anyone who cares about how the government might restrain the power of giant media and tech companies. 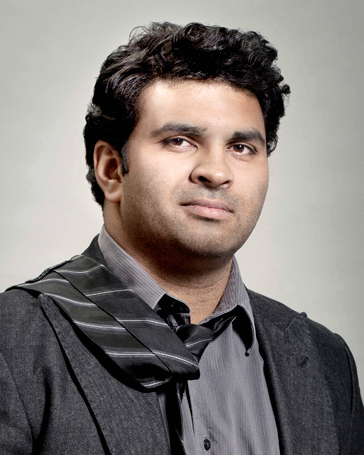 Technology journalist Nilay Patel is editor-in-chief and co-founder of The Verge. He joins us now by phone. Welcome to CounterSpin, Nilay Patel. JJ: Well, there are strata to this. There is the case the Justice Department might have made—and some say this maybe wasn’t a good deal for the state to focus on, to address antitrust concerns. Then there’s the case the Justice Department did make. And then there’s the judge’s ruling, both its likely impact in the real world and its rationales, which are, let’s say, concerning. As you note, very few people are going to plow through this 170-page opinion, but you did. What do you think is most important for us to know about what’s in it? NP: The ruling is particularly strange, and Judge Leon seems very excited about the prospect of AT&T owning Time Warner. But I think the main thing for people to understand is that legacy media companies like Time Warner are terrified of Google and Facebook and Netflix. And they’re particularly terrified because typically, if you’re the CEO of HBO, your relationship to the end-consumer is mediated by a cable company. So you want to buy HBO? You call Spectrum cable, you get HBO, HBO sells the content to Spectrum, Spectrum sells the package to you. Netflix has bypassed that. They sell you a direct subscription to Netflix. Google and Facebook have bypassed that, right? You have a direct relationship with Google and Facebook. Google and Facebook also own gigantic advertising businesses, which are directly threatening channels like CNN, which rely on an enormous amount of advertising revenue. So from Time Warner’s point-of-view, they needed to get closer to the consumer. And today, literally today, AT&T rolled out its new television package, called “AT&T Watch.” It will be preloaded on AT&T phones, and indeed, you will be able to watch CNN for free on AT&T phones as part of your data plan, and all other video will cost you money against that data plan. So there’s this very obvious anti-competitive effect that will occur because AT&T now owns video that it will give you for free, and other video services will hit your data cap, and you will effectively have to pay for them. The government, I think, was not able to really make this argument, because that is fundamentally the net neutrality argument. And so the DoJ cannot make the net neutrality argument while at the same time Trump’s FCC is tearing down net neutrality. And I think that conceptual knot was the one the judge might have been able to untie, and he basically just declined to even think about it. JJ: That’s really, really interesting, because, yeah, the surface thing we heard was, “AT&T is a distributor. Time Warner is a content producer,” so therefore their merger isn’t anti-competitive, because they’re not reducing the number of players on their particular level. But that’s a very shallow understanding of an anti-competitive effect. NP: And that’s the standard model. And I think that standard model has worked as well as it’s worked for 40 years. And there has not been a DoJ lawsuit to block a vertical merger of this type, using that model, for 40 years, as the judge knows. I think where it becomes very difficult is, the lack of competition in internet service in this country is acute. So there’s only four national wireless providers. If you are looking for wired internet service, over half of the country actually only has one or two choices for wired internet service. So as these companies become bigger and bigger and bigger, their incentives to bundle their own content into their internet packages gets higher and higher and higher. And you, as a consumer, have less and less choice to get away from those bundles. So at the same time AT&T is buying Time Warner, Verizon has bought the Huffington Post and AOL and Yahoo!, and they’re going to bundle their Go90 service into Verizon data plans, and they’re explicit about this. So they’re going to install ad-tracking technology that AOL has built at a pretty high level, and use it across their network of Verizon products and devices, Yahoo! fantasy football and HuffPost Live and the millions of websites AOL owns, to create an ad-tracking network that can compete with Google and Facebook. And they’re going to use the location data of the phones. AT&T, when they talk about Time Warner, they talk a little bit about preserving the value of CNN, and making sure that it keeps its journalistic integrity, and the great HBO shows that everybody loves. But they also very explicitly talk about needing to build an ad network that can compete with Google and Facebook. And I think that is the piece of this puzzle that seems to go unremarked upon, except when Judge Leon, in his decision, talks about how interesting it could be, and how innovative it could be, if the advertising was more personalized on AT&T devices. Which to me, if you’ve experience personalized advertising on mobile phones, does not seem very exciting, because it’s often very bad, but that’s where we’ve arrived. JJ: Exactly. And the Dallas Morning News, in the piece headlined, “Merger May Mean More Choices for Consumers”—you know, “may mean,” I guess it may mean cupcakes rain from the sky, also—but within that, they mention “targeted ads” as one of the things the new company may “serve up” for consumers, as though that’s really something that consumers are waiting for with bated breath. But I wanted to ask you about media coverage of media mergers like this, because we see no shortage of stock market impact reports. And then for everybody else, the angle is one that I saw in a local daily: “How will the marriage of the two companies affect your binge-watching abilities?” And it’s not that the end user, “What’s going to happen when I turn on my device?”—that’s an angle, of course, but the consumer-as-citizen piece seems to be largely missing. And not even the bromides that we used to get, where there’d be a story of a merger and there’d be a quote somewhere in there, “something something public interest,” you know. These companies are shaping our social and our political interactions. It just seems to warrant more scrutiny from the media itself than it’s getting. NP: Look, if you’re a conservative and you watch Fox News…I’m confused, but let’s say that you were doing that. You should be troubled by the fact that AT&T’s going to start preloading CNN on every single one of its Android phones and giving away for free, and Fox consumers will have to effectively have to pay against their data plan. That should concern you. That should actually concern everybody, that one major news network will now be prioritized on AT&T devices and all the other ones will not. 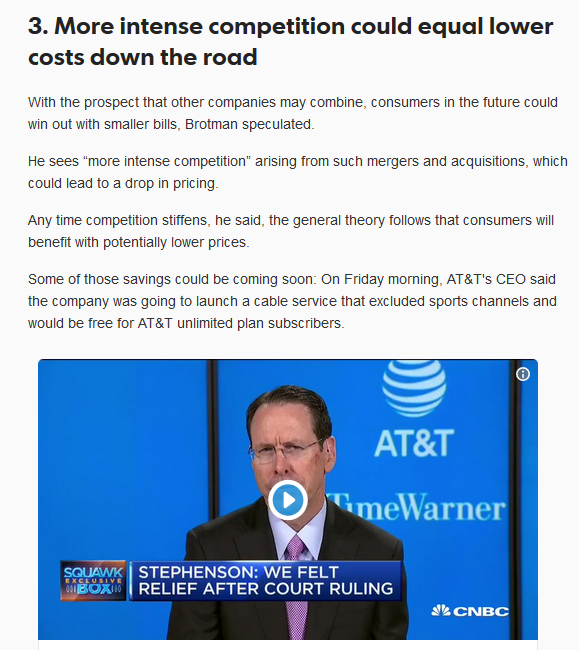 What I think is also true, and you brought this up a little bit ago, the classic merger analysis has been a consumer-benefit analysis, and the way that you measure consumer benefit is, “Do we think this merger is going to drive prices up,” right? If we reduce competition in the market, the incentive to raise prices will go up, because there’s less competition to drive prices down. And I think we’re now at a point where both on the left and the right, there is a lot of interest in rethinking our antitrust law to account for competitiveness, instead of simply price. And price-as-a-proxy-for-competitiveness works when there are prices, and it obviously fails when things are trending to free. And I think that the long history of the internet is we give things away for free. And so it is time, and I think you are seeing this again, both on the left and the right, a rethinking of how we should apply our antitrust law. NP: Yeah, AT&T only buys Time Warner once in a lifetime. JJ: Yeah, and I really do think we have to find a new—from the reporting angle—we have to find a new consumer angle that isn’t just—you know, I found this “Five Things to Know,” this explainer that ran, and “Number 1: You likely won’t pay more.” You know? “Number 3: More intense competition could equal lower costs down the road.” Two of the five are, “it’s not going to cost you more,” and that frame has to shift. NP: If you’re interested, it has two names: One is a fuddy-duddy academic name and the other one is a fun name. But the fuddy-duddy academic name is the New Brandeis Movement for Antitrust, and there’s a bunch of conferences, the Open Market Institute’s all over it. And the other name that people are using is the “Hipster Antitrust,” because all of the proponents are basically young people who look cool, and it’s a growing movement. I mean, there’s been, just in the past year, the Economist has touched on it, the Nation has touched on it, BuzzFeed just went to a conference where the CEO of News Corp was arguing with the head of the antitrust division about it. I run a consumer technology publication. It’s crazy to me that I have an audience that wants to know about antitrust, but really the answer to, “How do you regulate Amazon when they are constantly pushing prices lower?” is fascinating. JJ: We’ve been speaking with Nilay Patel. 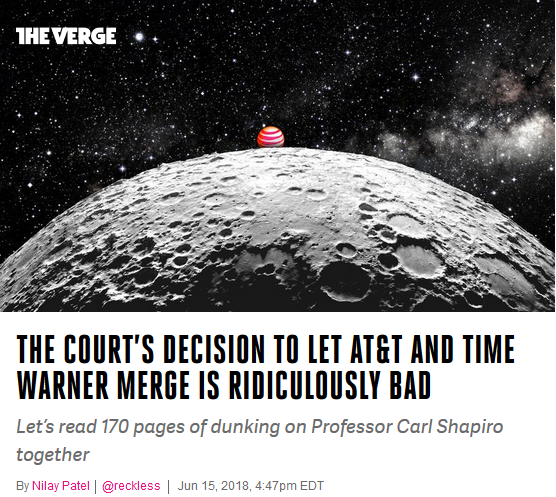 You can read his piece, “The Court’s Decision to Let AT&T and Time Warner Merge Is Ridiculously Bad,” at TheVerge.com. Nilay Patel, thank you so much for joining us this week on CounterSpin.